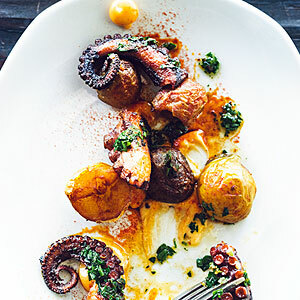 From the owner of ZuZu, a beloved Spanish restaurant down the street, this tapas bar would be at home in San Sebastián. Scan the printed menu for your drinks, including sherries, beers, and an eclectic list of international wines. Food options are chalked on a board above the bar: pintxos like jamón ibérico de be­llota, smoked trout, and pato (duck) empanadas … you can’t go wrong.